Solomon Burke will set Aptos Village Park ablaze. Someone call the fire department! It's entirely appropriate that the Santa Cruz Blues Festival will be closed out by Solomon Burke. A bishop of the House of God for All People Church in the San Fernando Valley, this R&B legend brings the gravitas of an apostle to bear on his songs. Rather than fiery jeremiads about the wages of sin, Burke is an inclusive evangelical who feels that part of his mission is to "preach by the highways and hedges of life." A veteran of the heyday of soul, Burke brings a huge legacy to the stage. He was signed to Atlantic records during the early 1960s, and some of his songs for the label, like "Everybody Needs Somebody to Love" and "Cry to Me," were covered by legions of wannabe bluesmen, including an emaciated guitarist named Keith and a big-lipped singer named Mick. The Stones were drawn to the yearning falsetto and the desperately soulful pleading of a man who carried an impassioned message of love. Like his fellow preacher Al Green, Burke is a master of emotion when he sings, restating the theme a dozen different ways to get the message across. Backed up by smooth and supple bass lines, tight horn arrangements and crisp but laid-back drumming, his sound defined classical soul. It still does. After all, if it ain't broke, don't fix it. Inducted into the Rock and Roll Hall of Fame in 2001, Burke is now basking in his elder statesman status after years of obscurity. Most of his energy in the last few decades has been directed into taking care of his congregation and a massive family that includes 21 children and 75 grandchildren. "Every weekend is like a day care center," he tells me. "I'm the official baby sitter." Burke doesn't proselytize from the stage. In fact, the majority of the advice that he dispenses is just common sense. During our extensive interview Burke spoke about staying financially healthy quite a bit. "Life is just crazy," he intoned. "There are all these deceivers who are trying to get you with offers that will get you into debt. Then you are caught up into a cycle and they end up owning you." For a bishop, Burke sounds an awful lot like an investment banker. "We are losing our opportunity to prosper because we are spending too much on things. We must live simply and make plans for our children to go to college, to fund our pensions and to be aware of our futures." This message ties in well with the tunes on his latest record, Make Do With What You've Got. Produced by Rolling Stones impresario Don Was, the album features new tunes penned for Burke by luminary songwriters like Tom Waits and Bob Dylan. With such high quality material hitting his mailbox, how did he go about choosing which tunes to give the classic Burke vocal treatment? "If there is no message, then you can't record it," he says. "That's why one of my favorite songs on the record is the Hank Williams tune 'Wealth Can't Save Your Soul.' No matter how much money we might have, that doesn't mean that we are going to get into heaven. Taste the coffee. Smell the roses. Live simply." Burke's message is not complete without a healthy dose of righteous anger, though. Targeting the social ills that he deals with as a preacher, the bishop believes the real conflicts that we should face as a nation lie at home. "Billions are spent on terror and war when we could use that money at home in America. We could clean up the guns and the drugs and find the weapons of mass destruction in our own communities." More than any other performer at this festival, Burke has a higher mission. He is using his voice, message and music to raise awareness of the inherent good in all human beings. His mantra is one of faith, perseverance and love. Though the Lord gets bandied about in Burke's parlance rather frequently, he is all about inclusion. "Everyone is saved by their own beliefs. Everyone has different beliefs. No matter what your creed, we need that old-time religion to come on through again so we can find an answer to all our problems." 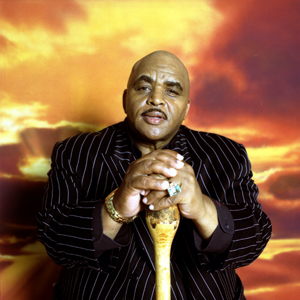 Solomon Burke plays the Santa Cruz Blues Festival on Sunday, May 29, at Aptos Village Park, 100 Aptos Creek Road. Tickets: one day admission $35/general, $20/12-and-under, $60/Gold Circle seats; two-day admission $60/general, $30/12-and-under, $110 Gold Circle seats. Call the Blues Hotlines at 831.479.9814 for ticket information, or visit www.santacruzbluesfestival.com. From the May 18-25, 2005 issue of Metro Santa Cruz.